Aux Arcs, Shin Yu Pai’s newest collection of poetry, reveals human experience in all its complexity, and in forms that shape-shift to individual purposes. The poems are striking in apparent simplicity, yet her use of language, lines, and space within lines, simultaneously simplify and enhance her objective. These poems are landscapes of language, word sculptures, admirable in their elaborate construction, yet fluid in the ease with which they become infused with universal themes. Through repetition, use of space on the page, and playfulness with words, the poet illustrates the recurrence of innate, human dilemmas, opposing needs, relationships, and even politics. Most touching is the balance that results when human motivations clash, or push gently against each other, when human virtues oppose. For example, in “First Response,” about the rescue of Chilean miners trapped underground more than a month, whose experience became an international media event, she returns to a main theme in the book: moments when individuals, or groups of individuals, address opposite needs. “First Response” reveals a transcendent observation when opposition and reconciliation seem simultaneous. The slanted stanzas along with the artful spaces within the lines seem made to tell this breathless story. The public yearns to honor the men’s dramatic survival; not all the traumatized men embrace their new notoriety. 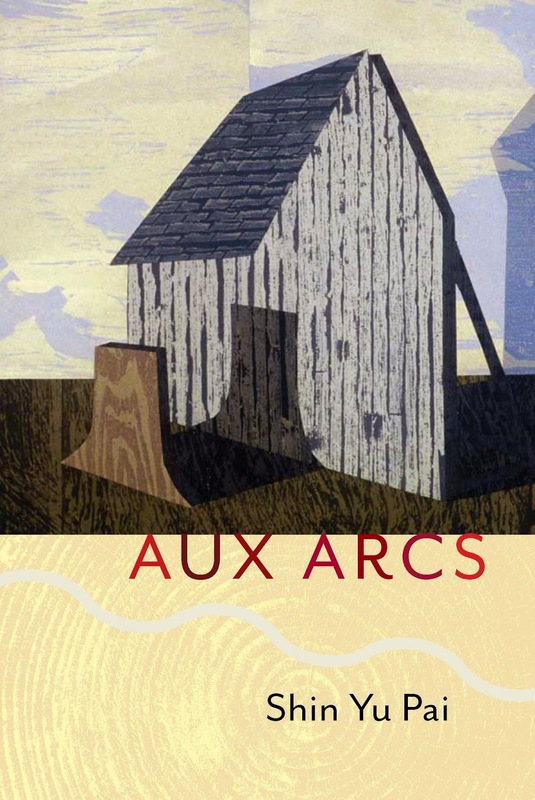 Aux Arcs is a beautifully laid out book. Sections are untitled, separated by a well-varied selection of fine black and white photographs. Politics, for example, is addressed directly in its own section, marked at the beginning with a photograph of an old Ringling Brothers horse-drawn circus cage, cardboard cutouts of tigers its only captives. bleed is one of the most cardinal sins . . .
A black and white photo of a shower stall marks the end of this section, as if waiting to cleanse the soul. The poet seems to suggest the consistency of dilemma. She asks questions of us. It is less a dilemma in this poem than a question posed to the exclusion of any answer, suggesting there is no easy answer. In “s t a r s h (r) i n e” Shin Yu shows us her love of word play, enough fun to remind us that poetry is, after all, about language. Even in this lighter poem, there is a sense of the observer, the poet herself, translating the moment, reminding us that poetry is not simple, whether it concerns a list, word play, or a duck in the water. By being observed, it is a human situation. Shin Yu has shown us a remarkable range in subject matter and style in her poetry and work as a visual artist. The shapes of the poems are often spacious. She has shown here that all things in her poetic universe are elements of a kind of human geography, the use of space within. Gerry McFarland recently graduated with an MFA in Creative Writing through the Rainier Writer’s Workshop at Pacific Lutheran University, Tacoma, Washington. He is a co-editor at Floating Bridge Press in Seattle, and teaches writing at University of Phoenix. His work has appeared in Talking River, Zyzzyva, Sanscrit, Crab Creek Review, Crucible, Bayou, Limestone, and several others. He was awarded the 2005 Sam Ragan Prize and was a finalist in the 2003 WinningWriters.com War Poetry Contest.